Heated battles in Round #6. 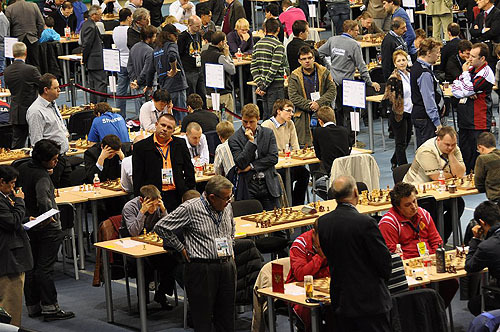 Round #6 Analysis: With five rounds left in the 2010 Chess Olympiad, there is still a long way to go. However, the heavyweight bouts have begun. In the sixth round, Georgia faced Armenia and a battle of traditional rivals. While nothing came of the top boards, but Arman Pashikian beat Tamaz Gelashvili while Levan Pantsulaia evened the match with a win over Gabriel Sargissian in an instructive ending. The Ukraine’s Ivanchuk continues to his march toward individual Olympic gold as he is now on 5/5 with a 3357 performance after impressively dispatching of Hungary’s Peter Leko, the 2008 board #1 gold medalist. Judit Polgar suffered her first loss in what had been a spectacular Olympiad. 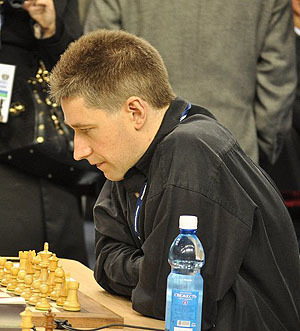 Pavel Eljanov has had a great year and capped off a win in a technical rook ending. The Ukraine will now meet Georgia on top board. The Hungarians constructed their tactics very competently. They even decided to give up one of their games with the white pieces, so that on the one board remaining they could try, if not to win, then at least to draw 2:2 with us. Let’s be honest: we’ve had no “penetration” in this tournament either from Malakhov or Svidler. There has been a debate whether Ian Nepomniachtchi (Russia 2) should have been called up to the Russia 1 team. He would have given the bottom board a reliable punch to go for points. Bareev has made several critical comments that cannot be constructive for team chemistry. One more loss for any of the Team Russia could put any medal hopes in jeopardy. Azerbaijan looks to be back on track after an earlier loss to Vietnam. They trashed India 3-1 winning on boards #1 and #3… Mamedyarov mated Sasikiran on the board. Viswanathan Anand’s absence really hurts this India team. G.N. Gopal, who was earlier suspended by the ICF, has been the most stable. Meanwhile the young Azeris will have a huge test against Armenia. There is still talk of Vugar Gashimov’s absence, but they are in the running with five rounds remaining. GM Michael Adams was preparing for a good battle against Magnus Carlsen, but could not have predicted his ideas against 1.e4. Photo by ugra-chess.com. Finally, the USA was led by Hikaru Nakamura (4½/5, 2964 TPR) who was gripped in a fierce battle with Vietnam’s Le Quang Liem. In a topical line in the Queen’s Indian and the game entered a fever pitch with pawns on the opposite 7th rank. There were those who stated that Le played to recklessly in the end and had chances to bail out and draw earlier. Nevertheless, the USA will move on to face a young and talented Polish team. The Americans will undoubtedly field the best team to make up ground in the board points. Round #6 Analysis: While there are still too many 4-0 scores at the bottom, fierce battles are being waged on the top boards. Russia 1 vanquished one of the main rivals in the Ukraine. While World Women’s Blitz Champion Kateryna Lahno beat Tatiana Kosintseva, Russia’s bottom boards carried the victory banner. Alexandra Kosteniuk is showing why having her on third board may yield some fruits. Georgia beat the USA in the bloody battle with three decisive results. 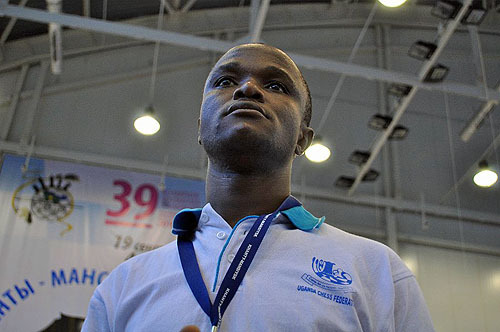 Nana Dzagnidze brutally crushed Irina Krush’ Modern Benoni in 26 moves. In the final position, material losses were imminent to avert a devastating attack. Anna Zatonskih came right back to level the score with a 31-mover against Lela Javakhishvili, but her teammate Tatev Abrahamyan was dismantled by Salome Melia. Will China be able to make a run for the gold? In other games, China got back into the winner’s circle by crushing Russia 3, 3-1. 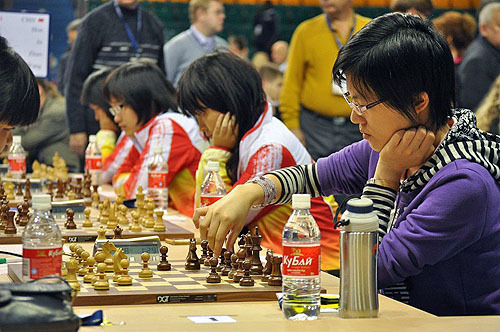 Zhao Xue lost to a 2120-rated player showing shades of her 2008 performance when she faltered in the second half of the tournament. However, she is still a formidable opponent and will be crucial in China’s push to reclaim the gold. They will face Georgia tomorrow in what could be a pivotal match for both sides medal aspiration. Both will find it difficult to make up the two points on Russia… both have already lost their matches against Russia 1. All of the main contenders will be facing each other in the next round. The issue with the women’s competition is the wild swings in the standings. In the end, the top contenders will have met and there will be strange pairings in the end. For now, the top teams are poised to vie for a medal.